You can join a new piece of yarn to the old one in several ways. This is one way to do it, and it suits for woollen yarn. The yarn doesn't have to ben 100 % wool, but with superwash yarn this won't work. The shorter the tails for splicing are, the less the splice spot will show up in the finished item. When there's old yarn left only 10 cm or less. Open the plies of both old and new yarn, and make a fan-like fringe, about 2-3 cm long. Thicker multi-ply yarns may be better if you make the 'fan' thinner by cutting off one ply before felting. Set the fans on the top of each other, on you other palm. Lick your fingers (or use water), and roll the yarns between your palms rather vigorously. If the yarn feels too dry, moisten again. Energetic rolling for about 10-20 seconds should make a firm join. Tension the following loops near the splice spot a bit more gently until you have passed the splice spot. Different woollen yarns have different felting qualities, some felt easier and better than others, so if the splice happens to break off, undo a couple of stitches, and make a new splice. In some instructions it is said that one 'must not' cut the yarn with scissors, but only tear if off by hand: Pull the yarn tight between your hands, twist so that the ply opens, and tear off. However, joining a new lenght of yarn works just as fine with a yarn cut with scissors. If you cut off the yarn on the bias, that should make a felted join smoother as the ends thin gradually, and the same applies for a plaited/braided splice, too, it is easier to pick up the the ends in between the plies when the ends thin gradually. This also makes pulling the splice spot through the stitches smoother. Suits for yarns that do not felt, e.g. superwash wool, artificial fibers, cotton, but also for wool. Split the plies of the new piece of yarn (like letter Y ), place the end of the old piece of yarn in between, and plait. Pinch the starting poing tightly between thumb and forefinger while plaiting, and plait tightly. Finally, either finish by moistening the yarn and felting the splice by rolling it between palms, or use the tip of the needle as a hook (or use a small crochet hook), and pull the tiny end of the yarn from between the plies. This will lock up the ends, and they will not slide when you continue with next stitches. Suits for tighly plied yarns. Place the ends of both old and new yarn on the top of each other for about 5 cm, and use the tip of the needle (or use a small crochet hook) first to pick up the other end from between the plies, in a few places, and then in a similar way, pick up also the other end of yarn from between the plies. If the yarn felts, you can make the splice stronger by moistening the splice, and rolling it between your palms (see above). If you cut the yarn on the bias, the ends will thin gradually, and they will settle softer on the splice spot. This methode suits for a tighly plied yarn. Open gently the plies (about 3-4 cm) at the ends of both the new and old piece of yarn. Place the ends on the top of each other, parallel, and twist the yarns carefully so that the plies will gain a twist again. If your yarn felts, you can make the splice stronger by moistening the splice, and rolling it between your palms (see above). Making a knot is another option, of course. Place the knot on the reverse side, and hide the ends later. In nalbound socks, though, it is better to avoid knots on the sole (heel, ball of the foot) because even the smallest knots tend to feel on that area of the foot. From Finland I have two kinds of information on using knots. Older nalbinding instructions say knots must not be used for splicing, and older people think knots in nalbinding are a no-no. Some of teh about 80 years old nalbinder I talked with in autumn 2010, stated emphatetically that they have never done a knot in nalbinding. That may stem from old beliefs that the clothes dressed on a dead person, including nalbound mittens and socks, must not have any knots, so that the knots will not keep the soul of the dead person from getting free. On the other hand, at least in some areas in Finland joining a new length of yarn by knotting has been common. In the nalbinding material collected by Tellervo Soisalon-Soininen in 1950's (from Polvijärvi, Sakkola, Äyräpää, and Kuolemanjärvi) all the interviewees used knots. 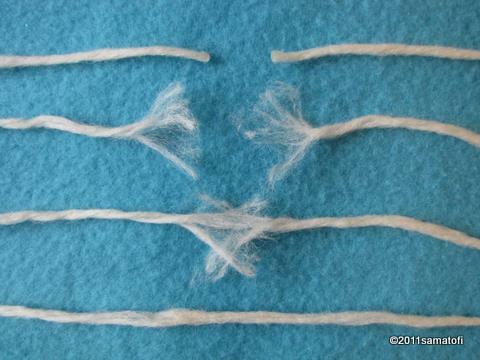 Splicing by felting needles works, too, even with artificial fibres, say some who have tried. On this video Ms Aili Kuronen, from Finland, shows how to change a new colour (to make a spotted decoration, for example), but you can use this same methode for changing a new piece of yarn. Imagine the white yarn as the old piece you are running out, and the gray yarn as the new length of yarn. The stitch is not completed fully, ie the 'old' yarn will not go under the thumb loops, but you leave it on the reverse side, and then take the 'new' yarn instead, and finish the stitch. Hide the end in the loops on the reverse side. Here's another video on changing the yarns on the reverse, from 2:20 min onwards (video). If you are making striped nalbound mittens or socks, it is not necessary to cut the yarns off when changing colours (see videos above), but just leave a loose strand on the reverse. Another option to make striped mittens or socks, is to nalbind both/all colour stripes at the same time, as in spriral. Each colour is worked less than one row at a time.